Day after day, hour after hour, I listen to the intimate details of my clients’ lives. If you had my job, you’d be less harsh with yourself. You would be able to see your struggles as part of the human experience. You would feel less alone. And you would know the truth – no one has it all figured out. Everyone is struggling in some way, most of the time, regardless of what you see on the outside. Attending to the day-to-day demands of life is tough enough, but add in unexpected challenges and tragedies, it makes all of us want to throw in the towel at least some of the time. And because our brains are designed to downplay the good and focus on the bad, it’s easy to get caught up in everything that is going wrong and forget about what’s going right! Our inner critic so easily goes into overdrive and eradicates any sense of self-compassion or legitimate acknowledgement of what we are doing well. Our judging self lifts the bar higher and higher. And our natural tendency for comparison leaves us feeling alone in our inner struggles. So as we are winding down 2017 with celebrations galore, I thought it only appropriate that you celebrate YOURSELF! 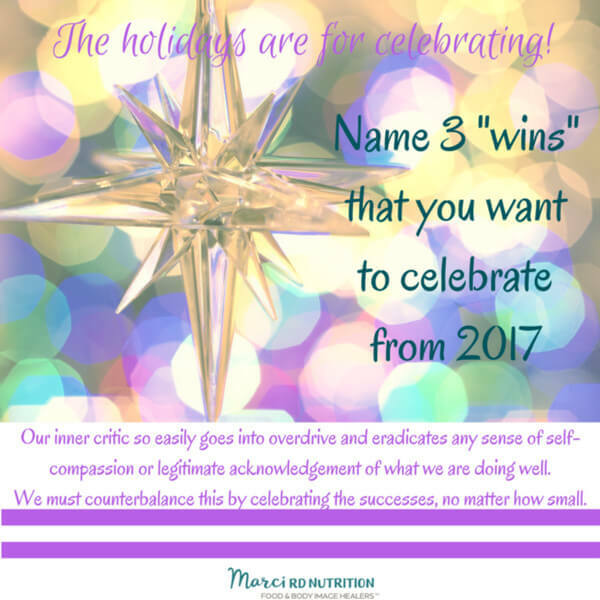 I’m extending an invitation to help you counterbalance our natural tendency of self-judgment with a celebration of “3 Wins for 2017.” They may be related to your relationship to food and body image. Perhaps your successes are connected to improved self-care. Or you may be celebrating the days you got out of bed when all you really wanted was to escape in the covers. I prioritized my physical self-care by keeping inconvenient medical appointments, even though I’d rather not disrupt my work schedule. I reduced the amount of time spent on social media on the weekends. I re-doubled my efforts to pre-prep simple meals by roasting a big batch of vegetables on Sundays. Now it’s your turn! Please share your “3 Wins for 2017” by visiting my Facebook page. I’d love to hear what you are feeling good about despite all that might have been hard for you this past year. There is no success too small to celebrate. And if you need some practical food advice as the holidays continue, check out my Thanksgiving blog if you haven’t already!